Mumbai better known as Bombay is a famous city of neighbouring country, India. While our new generation is gifted with “hate India” material, we think it’s a sin even to read about and tour the beautiful land. But, The love of tourism comes naturally to some like me. Let’s not consider the Hate and read about this beautiful land. Do leave your feedback! 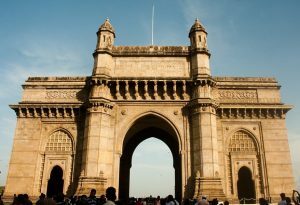 The most famous place of Mumbai is the gateway of India. The beautiful place is a land mark of the British Raj in India. The fort overlooks Arabian Sea and gives a beautiful view of the sunset and rain in Novemeber to March period. The elephant’s caves are located nearby and tourist travel by motor boats to the caves. Gateway was awarded the 3rd Most attractive place, while Istanbul’s Sultan Sulieman’s Mosque and Topkapi were 1st and 2nd respectively. 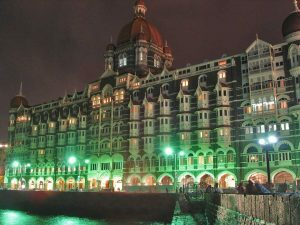 The Taj Mahal hotel is a beautiful place located just in front of the Gateway. It is popular for its pure Indian welcome to the tourists. The hotel serves traditional Dishes while “Jalebis” “Biryani” and “Pani poori” are very much loved by the tourists. Located in the city centre you can easily walk to the Malls and coffee shops. 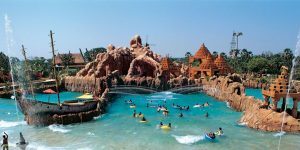 EsselWorld is an Amusement location of Mumbai, especially for the children. It is the best place to hang out with friends or family. With tickets available at cheap prices, EsselWorld has everything you might find in Disney. Roller coaster rides here are something you will remember for life! 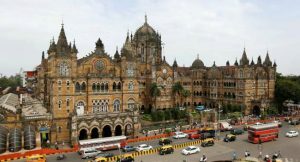 The historical railway terminal of India is Chhatrapati. It was built during British rule in India. Almost every train that travels across India stops briefly at Chhatrapati. Interestingly, The Samjhota Express that has connected Pakistan and India for over a century and is somehow an example that deep inside we are connected. Samjhota Express has always been on its route no matter its war or peace. A good example set by both countries. This is an Indo-Islamic architectural structure and a very peaceful mosque in India. 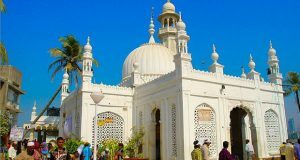 It is a Holy place of Mumbai and is always crowded. People come here to pray and it is believed prayers turn true here. The religious tolerance of Indians is remarkable regarding this place. All of the governments of India have always tried to make this place better and to preserve this monument from decay and rain. 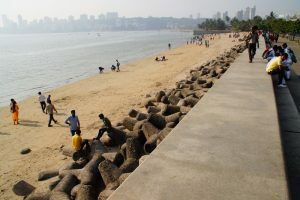 This is the best public beach in India. The atmosphere here is admirable. The cool breezes keep blowing here and make the coastal area look lovely. Crowded with tourists in evening, it is a cheap place with vendors serving traditional foods of India. Hello. This is Sadaf Abbas. I am a writer, published in various magazines, yet I ain't excellent yet. I am looking forward to be a big name that raised from Pakistan. I respect suggestions and criticism whole-heartedly and appreciate any such comments and advises. Sadaf abbas I think you are not NORMAL! YES I said you are not normal at all….lol…….okay for your convenience India almost everyday killing our citizens, civilians and soldiers in cross border firing….. from last 70 years we have witnessed Indian atrocities in occupied Kashmir….. what happening with Muslims in India not hidden from anyone… You are saying we are wrong haan …. these all violations are not real people dying everyday is a source of fun for you…. I am completely unable to understand where you people have been brought up ….. what is the purpose of your life…. millions of people died after partitions its all joke for you…… who the hell you people are what is you motive of using this forum at least……I don’t know there is any check and balance exist for using this forum or not…. I think everyone can write anything here……. You people I think just want to talk BLA BLA BLA ! not thinking before writing. Ask your forefathers who asked for Partition of this Beautiful subcontinent called India? Do ask your forefathers who raided and attacked Kashmir after 1947? Also ask them what was the popular perception of Kashmiris about Pakistan when it was formed? Is this the motive of your life to spread venom on anyone who talks sensible? Is this how you enjoy freedom of speech by abusing and demonising person who doesn’t hold the views as you?? If you like India that much, get the hell out of here and do the remaining praises once you have left us, ok? Do you ‘MOM BATTI MAFIA’ and sorts remember the faces of young Kashmiris fired with pallets in their eyes or are you already blinded?